At Clyde’s, we feel that nothing pairs with a steak or some freshly carved prime rib than a fine glass of red wine. But there are definitely other options, and they’re all worthy. You could opt for a classic cocktail, like an old fashioned or a manhattan. But if you’re a beer drinker, we’ve got you covered there, too. 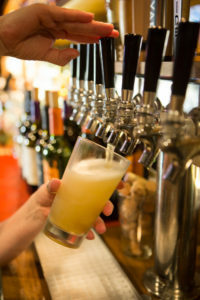 In total, we pour eight draft beers from our bar’s taps, and stock another dozen bottles and cans so you can order the beer that best suits your tastes, from common domestics to carefully crafted Pacific Northwesterns.